It’s been a while. There’s been cooking and eating, just not too many pictures. This tart was finally a worthy choice. A few weeks back I saw Jacque Pepin on PBS make a tart that his mom used to make. It looked real simple, a food processor crust, a quick pat into a fluted tart pan, some fruits and sugar, and some time in the oven. Jacque has a knack for putting together some real tasty dishes with minimal time and fuss. 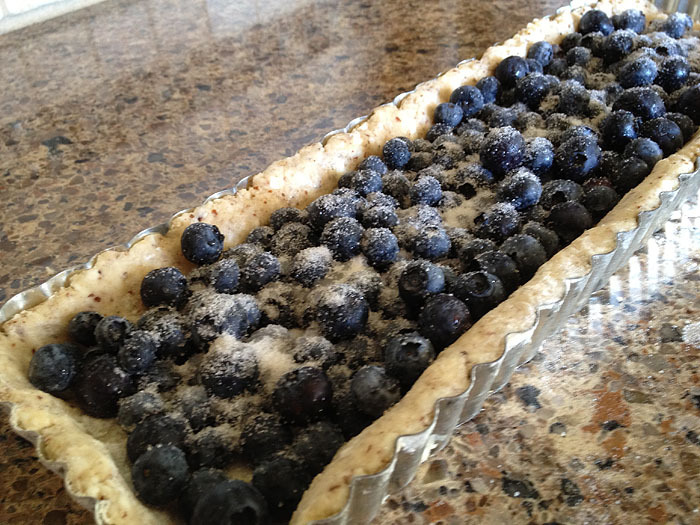 He made this tart with apples which I tried and liked but I wanted to do something different, hence the blueberries. This tart is so simple to put together that I even went against my better judgement and skipped the scale and went to volume measurements on this one. Trust me, the proportions aren’t all that strict and you can mess around with the flours, the sugars, and the fats if you’d like without much fuss at all. For my take on Jacque’s recipe, I used a combination of white flour and almond meal to give the crust a nutty kick. I’m including as close to the original recipe here as I can remember. The crust is a basic sable breton which can easily be manipulated. Throw all the ingredients except the water into a food processor. Add a small amount of water and pulse. If the dough did not come together, add a little more water and repeat. Once you get a crumbly dough, dump into a fluted tart pan. Press dough into the pan and up the sides making sure it’s mostly even. Add a liberal amount of sugar over the top of the fruit. Bake in 375F oven for about 30 minutes or until the crust is browned and all puffy.